That annoying little soap reservoir bottle...we know you don't like refilling that thing. Neither do we. That's why we created the SMARTConnect kit: to get rid of that reservoir bottle entirely and give you a maintenance free soap dispenser. 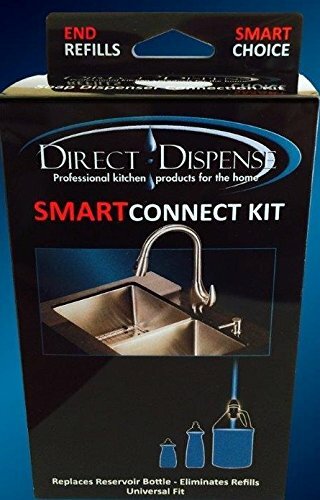 The SMARTConnect kit lets you quickly connect your dispenser DIRECTLY to any standard size bottle of soap stored below your sink. You will never have to waste time refilling an empty reservoir bottle again. Its that simple. How does it Work? The SMARTConnect Kit contains special tubing and a patent-pending universal-fit plug which is designed to fit into almost any bottle of soap stored below the sink.When time comes to replace the bottle of soap, the universal-fit plug is simply insert it into a new bottle -- its that easy. There is no need for refills and it will always be easy to tell how much soap is left in the bottle. What are the Benefits? - No messy refills - Conserves soap as none is spilled during refills - Easy to install - Eliminates all soap dispenser maintenance - Durable and long lasting construction Please visit our website (www.direct-dispense.com) for additional information. IMPORTANT, PLEASE READ BEFORE PURCHASING: **DIRECT DISPENSE REQUIRES A PROPERLY FUNCTIONING DISPENSER HEAD IN ORDER TO WORK CORRECTLY. Soap dispenser heads should be replaced every 3-4 years as they do wear out. In the rare instance that soap does not pump when Direct Dispense is installed, it is almost always due to a worn out soap dispenser head that cannot draw soap up through an extended tube. Replacing the worn out dispenser head will solve this problem. Please visit the "Troubleshooting" page on our website for more information. **Certain irregular bottle sizes, such as KIRKLAND DISH SOAP and 52 oz. AJAX bottles are not recommended for use with the product. Palmolive, Method, Seventh Generation, as well as most other brands use standard bottle sizes that work well. Eliminate the reservoir bottle and you have eliminated every problem associated with counter top dispensers. Now there is a simple way to quickly replace annoying and obsolete reservoir bottles on any soap dispensers system and make it maintenance-free. The ingenious PATENT PENDING SMARTConnect Kit securely connects any soap dispenser pump directly to almost any bottle of soap stored below the sink. Instillation is fast and easy - then enjoy a completely refill-free dispenser. Includes: universal plug, 48" extended tubing and a securely fitting pump connector plug. Precision rubber molded parts and 48" soft flex tubing make the SMARTConnect Kit the very best dispenser connection product on the market ! If you have any questions about this product by Direct Dispense, contact us by completing and submitting the form below. If you are looking for a specif part number, please include it with your message.